Quick overview A compelling and ground-breaking piece of narrative journalism that gets right to the heart of divided Britain and its dysfunctional jobs climate. 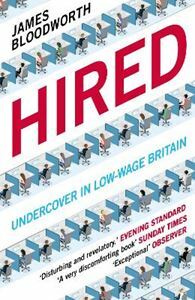 In this essential expose, James Bloodworth goes undercover to investigate how, for many, working life has become a waking nightmare. From the Orwellian reach of an Amazon warehouse and the high-turnover rate of a telesales factory in Wales to the time trials of a council care worker and the grim reality behind the glossy Uber App, Hired is a clear-eyed analysis of a divided nation and a riveting dispatch from the very frontline of low-wage Britain.